By Gabrielle. Photos and styling by Amy Christie. I love the look of eggs dyed with plants and flowers, but every time I’ve planned on attempting it in years past, I get intimidated sourcing dye ingredients and stop myself up. So instead of gathering a dozen different materials and spending too many hours experimenting, I decided that this year, I would focus on one easy to find plant and see what it could do. The plant? 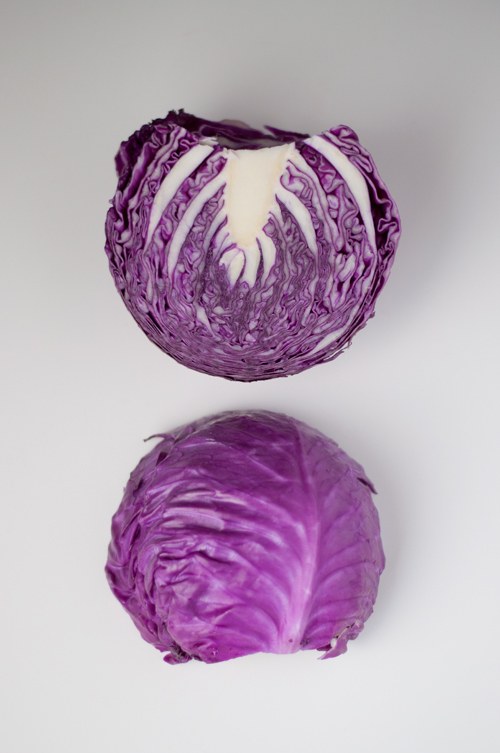 Common red cabbage. Available in every produce department of every grocery store in the country. Yes, it looks purple or sometimes red, but did you know it makes a great blue dye? It’s one of those things that’s hard to believe until you try it yourself. I love how they turned out so much I even want to keep the broken shells. I felt so much happy anticipation checking and rechecking them to see how the colors were changing. I could hardly wait to see the final results. Toss the chopped cabbage into a large pot with the water. Bring the water to a boil and then simmer for 20-30 minutes. When it is complete, add in the white vinegar. White vinegar is an acid which helps with the dye process. In my observations, the white vinegar also act as a color lightener. When I added it to my first batch of cabbage dye, I was nervous because I noticed the tone lighten to a more purply hue. In my research for this project, I found that baking soda acts in the opposite way. I added a pinch of it to the dye and the tone quickly turned more blue. I am not a chemist and, for the most part, I chalk the whole process of dyeing up to magic. So how do you get the different tones with just cabbage? Easy peasy. Simply vary the length of time the eggs spend in the dye bath. The deeper the tone, the longer the time. In fact, the deepest tones sat overnight! It was an easy process. I submerged the eggs and would just keep checking on them until I liked the tone. All of tones pictured were achieved with cabbage — with one exception. The navy tone was achieved using a blueberry dye. Blueberries, crazy enough, make a reddish dye. I used a little of that with my blue dye to get the navy. The blueberry dye mix I used was 2 cups water to 2 cups blueberries. I boiled them together for about 30 minutes and then I added 1/2 Tbsp of white vinegar. And that’s it! If you’ve every wanted to experiment with natural dye, I highly recommend red cabbage as the perfect starting point — that one ingredient can create a full ombré look! Also, I’d love to hear if you’re trying any special techniques to dye your eggs this year? P.S. — More natural dye! Use onions for orange, turmeric for yellow, and beets for red, and here’s how to make green. This is brilliant. I could paint a whole house to match those cabbage eggs. I grew up in Santa Barbara and during Fiesta! they would take dyed eggs, blow out the yolk, fill with confetti, and cover the hole on top with tissue paper. I want to make cabbage Fiesta! eggs. Great idea, beautiful photos. I’ve seen those confetti eggs and they make me grin every time! I hope you make some. Did you dye boiled eggs or hollowed out eggs? These are lovely! I had some fun with cabbage hues as part of a high school science project. Silly and colorful and so not award-winning science. I used boiled eggs, but I’m thinking hollowed out ones would work just fine. But don’t be like me and try it with brown eggs. : ( It didn’t take, so duh on me. I’m eager to try again with white shelled eggs. use onion skins and brown eggs (the main type available in Australia, not many white eggs here in the stores) You can place a leaf or herbs on the egg, wrap in stocking and tie and boil in the onion skin water. The eggs turn a deep red/ brown and you shine them up with olive oil. ha. I didn’t even see the comment below. whoops. 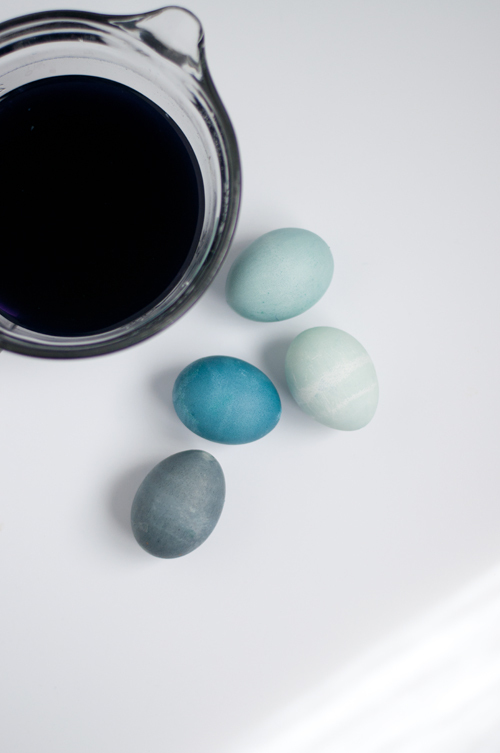 I actually prefer brown eggs for dyeing—more jewel tones instead of pastels. 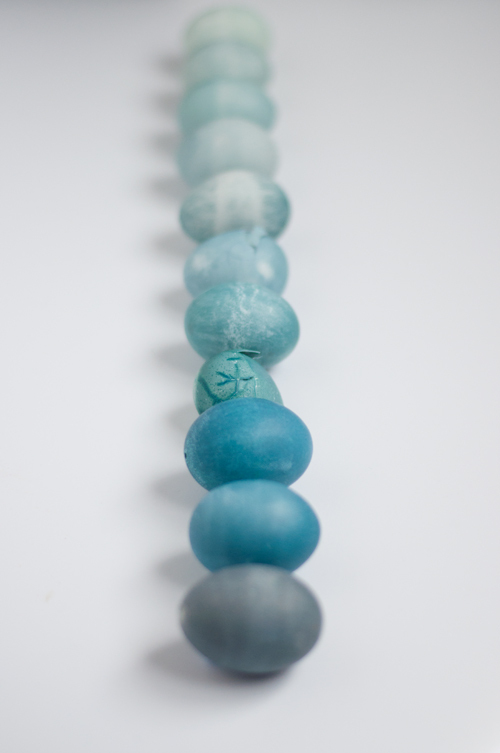 All those shades of blue are gorgeous! 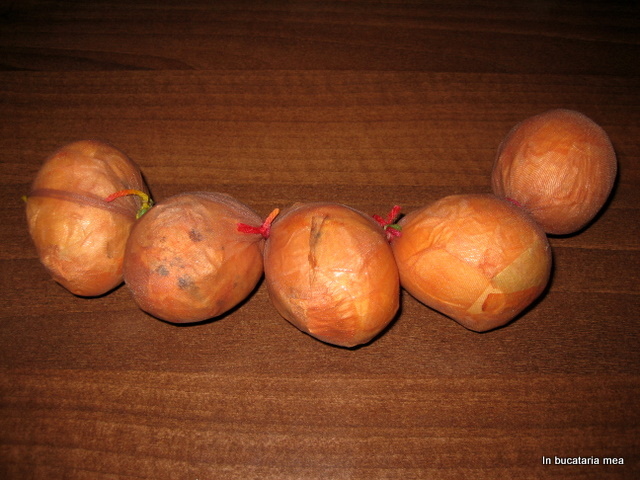 Years ago a friend showed me how to dye eggs with onions which she learned while in Russia. We placed parsley leaves on the eggs then wrapped a piece of cut nylon around it and tied it in place so it would resist the dye in a parsley leaf pattern. Then the eggs were placed in a slow cooker full of onions and water. They eggs turned out this beautiful brick red-brown color. Completely right! I grew up making eggs this way. After the dying process, the eggs are rubbed with olive oil and shined with a cloth (2 or 3 times per egg) and they achieve a marvelous shine! Onion dyed eggs are truly my favorite. Sounds gorgeous! And thanks for the cut nylon tip. I was trying to imagine how to keep the leaves attached during the boiling. We use old nylon tights/pantyhose, but my favorite is cheese cloth. The loose weave leaves a pattern on the eggs. Another comment said they sewed or stapled fabric around the eggs, but I secure mine with little hair elastics. I think hunting little plant bits to put on the eggs is one of my kids favorite parts of Easter. Wild violets are a favorite, but we do try new leaves and flowers nearly every year. So beautiful! I’ve been interested in making natural dyes since I stopped buying artificially-colored food. I’ve heard that you can also use turmeric to get an orange-ish color. Just curious, though – did the cabbage change the taste of the eggs at all? Boiled onion skins make a lovely bright orange dye – you can dye raw sheep’s wool with this too. Spinach! Wrap your raw eggs in spinach leaves and simply boil them for 7 mins. Beautiful light-green mottled results. AndI have to say your cabbage sky-blue is wonderfull! Sounds awesome! Do you use a cut nylon to keep the leaves in place? The traditional natural dye here in Serbia are onion skins! The give shades of orange,brown and red depending on how long you keep the eggs in them. You cook the eggs in the water filed with onion skins( from 4-5 onions on 5 eggs) and then you leave them for various amount of time depending on the shade you want. I think onion skins needs to be the next natural dye I try. How cool! Not natural but we love to use kool aid to dye our eggs- fun colors! I’ve heard of Kool-Aid dyes, but I’ve never tried it. Sounds like something my kids would love! Most years, we typically use the food dye drops. Dyeing after boiling? I’ve never heard of it, but bright pink deviled eggs sound fabulous! I’ll go do a search. Thanks for the heads up! My family makes pickled beets and eggs every yr for Easter! It’s an Eastern European thing. We use the beet cooking liquid to make a quick pickle brine and then mix the sliced beets, some white onion and a bunch of shelled hard boiled eggs in a container and topwith the pickling liquid. Then they sit in the fridge for a few days. They end up beautiful and are truly delicious! I am definitely going to try your cabbage eggs though! I have a bit of a blue obsession this year. I dye my eggs raw, too! I love baking and cooking with brightly colored eggs. I dye eggs using onion skins as well, but in a different way than described above. My grandmother and I used to do this together – we’d pick peach leaves off the tree in her back yard (I would bet that other types of leaves would work, but these were what we always used), place those around the eggs, then layer onion skins on top of that. 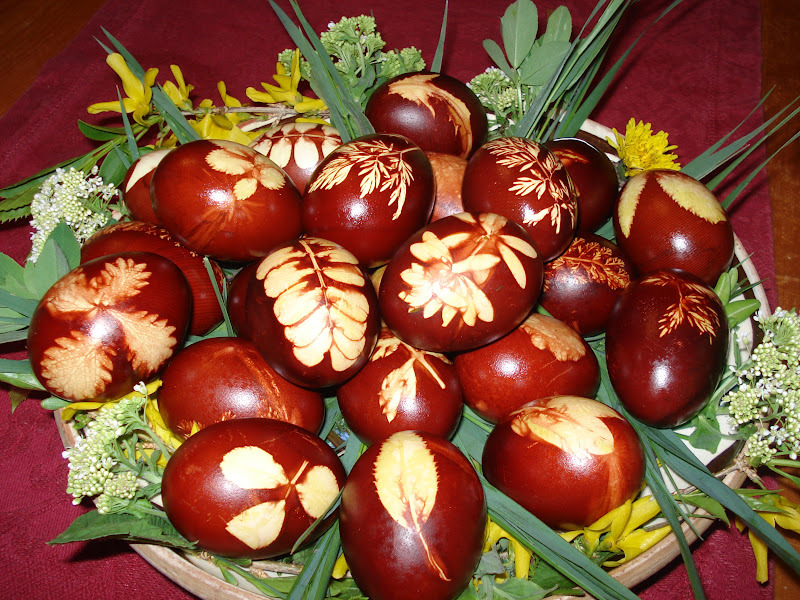 My grandmother would then sew fabric around each egg to hold the leaves and skins in place. When I was about 9 years old, I asked why we didn’t we just use a stapler!? ha, that made things go much more quickly. Then we dropped each one in boiling water (can’t remember how long). When you unwrap, you can see the green leaves, and the surrounding egg is a beautiful brown/peach color. Great post. I’ve never done this. Hope to try it this weekend. oh, this is tempting! I love blue and those eggs are so pretty. I think I could pull this off yet this Easter season. . . I am making our eggs, thankg! About a hundred or so years ago (feels like it, anyway! ), Victoria magazine did a piece where they made “marbled” eggs for deviled eggs. The boiled eggs were crackled by rolling them on the counter top and THEN they were dyed. The peeled egg then had a lovely marbled look and the deviled eggs were so pretty! Oh, what a joy to discover this post! We’ve been in France and away from the keyboard for a few weeks. I’m just getting a jump on things again and so happy to say hi! 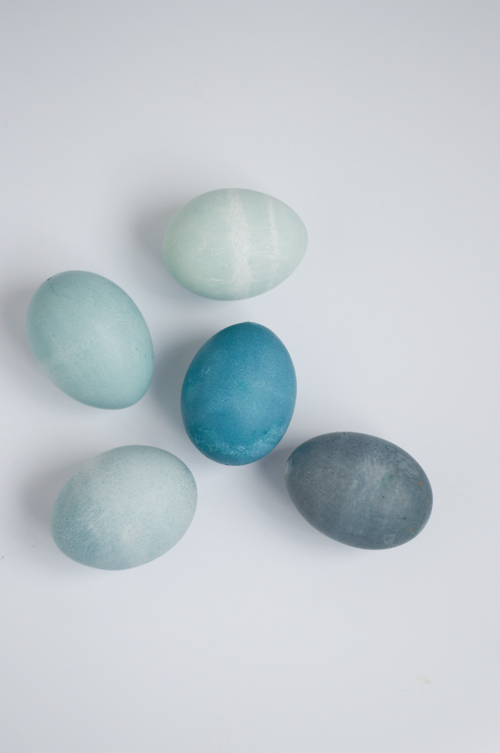 The last Easter post I managed before traveling was to show a few of our naturally dyed eggs and ideas, too. (We added onion skins, beets and tumeric this year, too) The colors and creativity using natural dyes have made me swoon! (The first time I ever shared a natural egg dye I went straight cabbage, too and and feel good to see you under the same spell — the color! Spectacular.) As always, it’s great to catch up! This is a goofy question but before I try it, I need to be sure…..after you have boiled the cabbage, do you drain off the cabbage juice and then add the vinegar or do you add the vinegar to the cooked cabbage? I love these and can’t wait to try them! coming up with a nice green . I tried different vegetables and the turmeric spice, but was disappointed with the green. Gorgeous–the bluebird of happiness must have laid them (or wishes she did)! And I agree, natural dyeing is magical. Hi there. I have the same question as Carol. 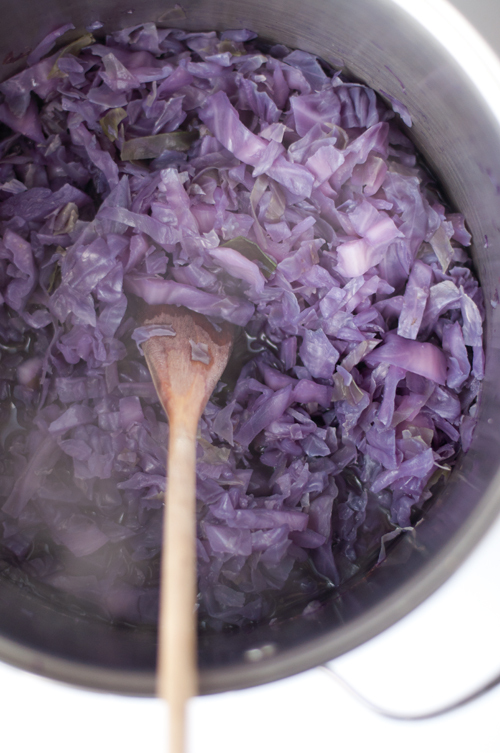 I’m simmering my cabbage now….but once it’s done….it’s kind of unclear what the exact next steps are. Do you drain the water from the cabbage or is it important to leave it in? Do we wait for the water to cool? Thanks! Hello is this a silly question, just wonder, can the cabbage dye be used successfully to colour fabric? The resultant colour is so beautiful I’d love to be able to use it for fabric crafting. We did it and they came out gorgeous! btw, the batch with only vinegar made the deep intense blue and the batch with vinegar and baking soda made the much paler blue… opposite of what you found in your experience, Gabriel! What an inspiring post and most beautiful died eggs! I was wondering if I can get such beautiful colours if my eggs are brown? So beautiful! I’m trying this myself this year but I have one issue that keeps messing with me! When I’ve blown out the egg, the inside membrane seems to seal the egg again, so its full of air.. making it very difficult to submerge as it will just float to the top immediately! Does anyone have a tip on how to puncture the membrane or get rid of it once and for all? Vinegar is entirely unnecessary with natural dyes. Its use comes from artificial egg dyes, which do need it. With natural dyes, vinegar can change the color (like with red cabbage which is a pH indicator) or sometimes it weakens the color. But it is not needed to make the color stick at all. omgosh! this is so helpful…thank you for sharing.. I am trying these tonight.. I have 40 blown out eggs to do, by Easter this Sunday, and I’m excited to try this! The color reminds me of spring and rebirth and Mama Robins and just makes me happy!